Hair-Loss, a problem that can surface at any age to anyone. We live in a society where your appearance does matter and your hair plays a big role in it. Thin hair and receding hairline do make you look older than you actually are. With the stress levels in this competitive world at an all-time high, we see many young men losing their locks owing to it. Hair Transplant in Delhi is the only option available that can reverse the impact but there are methods which can help arrest Hair Loss. Till a few years back, hair loss treatments were limited to medications such as Minoxidil and Finasteride. 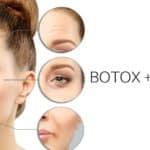 Over the past decade, a new and minimally invasive option has gained popularity is delivering great results in the treatment of hair loss and thinning hair in both men and women. This state-of-the-art treatment is called Platelet-Rich Plasma or PRP. PRP therapy is a nonsurgical, reliable and safe alternative medical procedure for the treatment of hair loss and thinning. PRP is a relatively new non-surgical option for patients who require stimulation and regeneration of hair for a number of hair loss conditions including Andro-Genetic Alopecia, Alopecia Areata and generalized diffuse thinning. The procedure makes use of a patient’s own platelet cells and plasma from their blood to stimulate hair growth. Platelets have various growth factors (GF’s) and cytokines that have been clinically tested to stimulate hair growth. 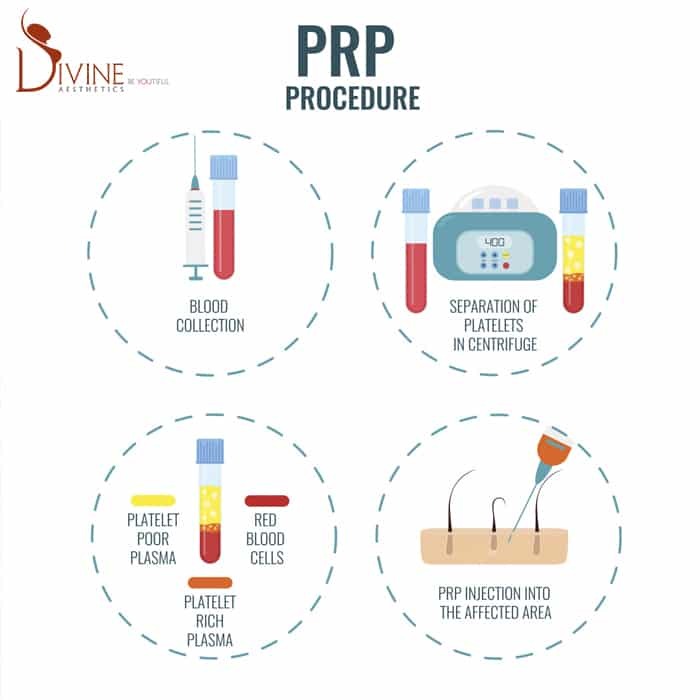 PRP (platelet-rich plasma) therapy for hair loss involves three steps in which a person’s blood is drawn, processed, and then injected into the scalp. Blood is drawn — typically from your arm — and put into a centrifuge (a machine that spins vigorously and separate fluids of different densities). 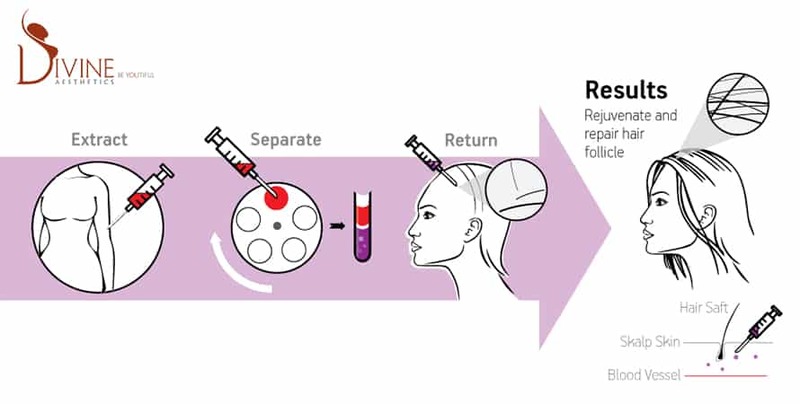 The PRP (platelet-rich plasma) is then drawn up into a syringe and is then administered into areas of the scalp that need hair growth. If you wish to learn more about PRP therapy or any of our other hair loss solutions, call Divine Clinic today at +91 9811994417 to schedule a consultation with Dr. Amit.